1 x 12" Braided hose with 10mm (3/8) banjo fitting. Hose meets DOT MVSS-106 requirements. 1 x 16" Braided hose with 10mm (3/8) banjo fitting. 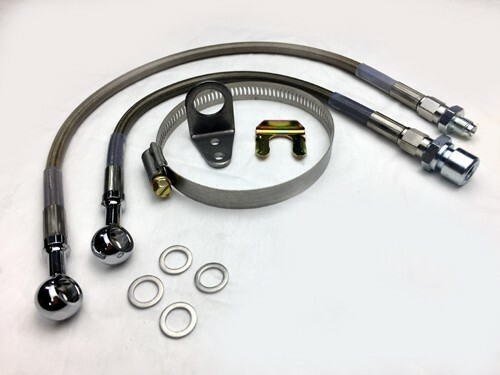 Hose meets DOT MVSS-106 requirements. 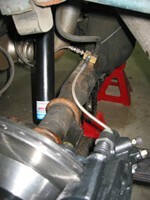 1 x Adapter for the end of the passenger side hose to OE hard line with 3/8-24 tube nut. Fitting includes groove for OE style brake line clip (included). 1 x Adapter for end of hose to drivers side port on our Intermediate Hose brass block. 1 x Brake line clip (passenger side). 1 x Clamp on hose bracket (can also be trimmed and welded to passenger axle tube). 1 x Hose clamp (used to secure hose bracket if not welded to passenger axle tube). 2 x 10mm banjo bolts (Select under 'Related Items' below). 1965-70 Mustangs using Cobra/Mach 1/Pony PBR calipers or any other caliper requiring a 10mm (3/8) banjo fitting.